Because of her association with these two monks, she gained considerable knowledge of the Buddha Dhamma and its historical background. She was determined to go to Sri Lanka, which she heard was the only country where Theravada Buddhism ( the Teachings in their pristine form) was well preserved. The Study of the Sraavaka Sangha (the Worthy Ones) had kindled in her a great desire to be a Nun herself She decided to give up her wealth, her homeland, her friends and her religion, and to set sail to Sri Lanka, then famous as "Dhamma dvlpd', the Island of the Doctrine. Sister Uppalavanna always chose to live far from the towns and villages, in simple abodes, be they rude huts, or converted caves, without any amenities, such as electricity or water on tap. She who had lived in the lap of luxury in Germany, did not even crave for the ordinary comforts available in some of the towns of Sri Lanka. Her view was that the closer one lived to nature, the easier it was to get on the "Path", When asked by friends as to why she did not write or discourse on the Dhamma, she replied that she was intent on treading the Path to Emancipation, as quickly as she could, and that she wanted to spend as much time on meditation so 1 as to get rid of the defilements in the mind. She further expained that Writings and Discourses could lead to self aggrandizement, which is a step backwards, and not forwards! Nearly all who came in contact with her, believed her to be a Worthy One (Sraavaka Sangha). They also believed that perhaps she had reached the 2nd Level to Sainthood Sakkaadaagaami. 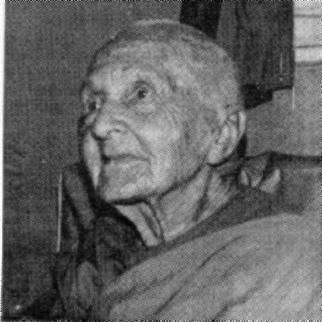 Sister Uppalavannaa passed away peacefully with a beautiful glow lighting up her face, in 1982, at the age of 96. It is certain that she attained another propitious human birth, where she would have every opportunity to tread the Upward Path steadily and surely to the attainment of Sainthood and Nirvaana. Sraavaka Sangha. When we think of the Sangha or recite that familiar verse enumerating the virtues of the Sangha, we must remember that we mean the Sraavaka Sangha the Disciples of the Buddha. At the lowest level the Sangha mean you and me, the Upaasaka, Upaasikaa. On the next level are the Bhlkkhu Sangha, the Ascetics. At the highest level are the Sraavaka Sangha, who are the Follower of the Path, Stream Entrants and Stream Winners. The Sraavaka Sangha are the "Atta Purisa Puggalaa', the eight types of persons who are in the process of attaining, and have already attained the various levels of Mental Discipline, leading to Sainthood; that is Sovan, Sakadaagami, Anaagaami and Arahat. The Sraavaka Sangha fall into four pairs of persons, "Cattari purisa yugani". those striving towards, and those who have attained the four mental states leading to Sainthood, as mentioned earlier Sovan, Sakadaagaami, Anagami and Arhat. Truly a very determined and energetic lot of persons! Therefore all these people who strive so diligently to eradicate the three Cankers Greed, Hatred, and Delusion by treading the Noble Eightfold Path, are worthy of our Sacrifice, our Hospitality, our Offerings and our Salutation.